born in the modern state of Israel. My mother was born in Libya where her family enjoyed a good life until the Italians, allies of Nazi Germany, marched on Tripoli and rounded up the Jews and sent them to a concentration camp in Italy.There in the mayhem of a nation at war, this 17 year- old refugee fell in love with a Jewish actor, oblivious to the fact that her handsome young fiancée was seriously ill. At their wedding, he drank a considerable amount of alcohol, fell into a coma and never spoke another word until his death ten days later. even before she knew Hebrew! I was born in those early days of the State in Tel Aviv. People were dirt-poor and needy, but out of that poverty came a camaraderie that was priceless. Neighbors were close friends and no one locked their doors. Even as children, we could walk around at night with no fear of any kind. My father went into business with two partners and started Pel Tours, today one of the largest tourist agencies in the Israel. But at 42 years old, he suddenly had a heart attack and died, leaving my mother with three little girls. Mother never remarried. I finished high school and at 17 married my childhood sweetheart who grew up in an adjoining neighborhood. I came from a very secular family and he from an Orthodox background, yet neither one of us thought much about religion, and so it did not affect our relationship. My parents were born in Yemen, a place of great poverty and isolation for Jews living there. In the early 30’s a large group of Yemenite Jews decided that now was the time to return to the land of our forefathers, believing that the days of the coming of the Messiah were near. My extended family came to Israel on a boat when my parents who are second cousins - were children. Later when my mother reached the age of 14 they married. My father’s father was both a rabbi and a jeweler by trade, and my mother’s father, also a rabbi, was the director of a “heder,” which literally means “room,” and is the word used for a school where young Jewish boys studied in those days only the Bible until age 13. By the time we reached the age of our Bar Mitzvah, we really knew the Bible thoroughly (that is technically, but not spiritually.) Only as teenagers did we then start studying rabbinical literature. It is a well-known phenomenon that Yemenite boys can read the Bible - and Rabbinical writings- upside down or from either side because our people were so poor they usually had only one Bible or one book per class and the boys would gather around that one book - on all four sides - and thus we learned to read those books from any angle. 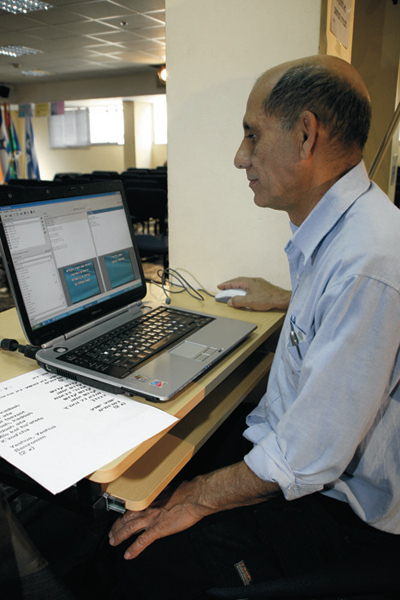 Although I was born and raised in Israel, I too can read the Bible in Hebrew fluently from any position as Yemenite rabbis continued with the same methods of teaching even after they came to Israel. My own birth took place under very special circumstances. In 1948, my mother was about to give birth to me, and so my father hurried off into the night to call the midwife. But, in those days, before Israel became a nation, Palestine was still under British curfew, and the Brits arrested my father, leaving him in jail for 48 days. It was 4:00 p.m., Friday afternoon on May 14 - just before the Sabbath was to begin. My mother had the radio on and heard our founding father David Ben Gurion proclaim that Israel was now an independent state. That same day she gave birth and I was registered as the very first child born in the modern State of Israel. My father and mother were very traditional in their religion, and although the Yemenite people are known to be tolerant and non-fanatical about religion, my father went to synagogue daily. Yet, when he arrived in Israel, he cut off his long side curls and dressed in normal clothes and didn’t reprimand us if we rode in a car on the Sabbath day. To honor my father, I went with him to synagogue for twenty-five years as did my brothers. But it was just something I did. As soon as we left the synagogue I would leave with my friends to go to the beach or to hang out. I never really thought about God although I certainly believed He existed. were reading - so again, I would just wait until we were finished and then go on with my “real” day. I married Orlet in 1972 and worked for 30 years for the postal service and later the telephone company, which in Israel were connected. But when a harsh recession occurred in the year 2002 during the Intifada, 4000 workers from my company, including me, were forced into compulsory early retirement. Yeshua was not my Messiah. I was sure that as Avihai got deeper into his faith he would begin to dress like the Amish people or wear some uniform like a monk and carry a big Bible under his arm. I felt deep inside that he had betrayed his roots and his family. He left me an Old Testament and also a New Testament - which I did not want to touch. But I did start to read the Old Testament, because I was determined to find the correct answers so I could set Avihai straight. But instead, I found I had countless questions. I actually wrote down 103 of them, and then as I continued to study, I realized I was finding the answers to these questions by myself but they were not the answers I had been expecting. Sometime after this, Avihai sent us an invitation to his wedding. The big question in our family was whether or not we should go to this wedding, knowing that it would be a Messianic one. way I can describe it - light in their faces. I began to cry uncontrollably. Fortunately, I thought, people would think that I was crying tears of joy because of Avihai’s good fortune. 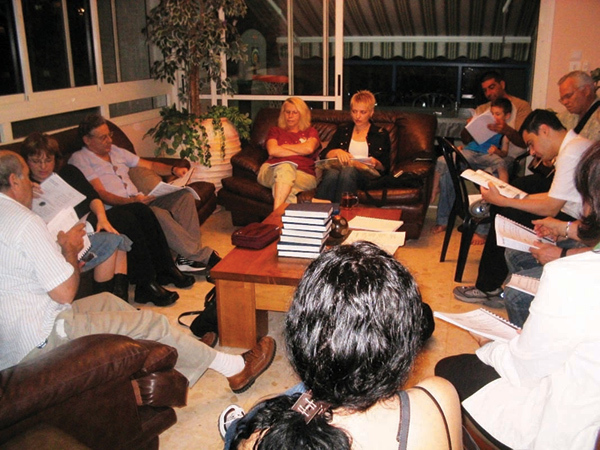 Yacov invited me to his house for a Tuesday night Bible study. Accepting his invitation, I took a girlfriend with me. Yacov opened the Bible and began to teach us about Messiah Yeshua. After the third Bible study, I accepted Yeshua as my Savior. It was then that I experienced a wonderful new relationship with my Heavenly Father. But how would I get Gideon to see that Yeshua was for him too? I prayed for six long years for my husband to be saved. When Orlet came to faith in Yeshua, she really changed. For one thing, I immediately noticed how much calmer she had become. Before, she would go out dancing and to all kinds of entertainment without me. These were things in which I had no interest, so she would go by herself. But I noticed that after her salvation experience, she stopped going out by herself and that pleased me to no end. However, I wanted to take my time to thoroughly study what I was being taught - to see if it was really true. Going to Noam’s congregation along with Orlet and our girls became an enjoyable experience for me, and I watched our youngest daughter come to faith in Yeshua at eight years old. When she asked if she could be immersed in water, I told her, “Yes, if this will make you like your mother.” I even went to the annual parade in Jerusalem and marched with the Messianic Jews! Yet I still hesitated to make the final step of commitment. We had gone to the immersion service of a friend, and there we heard one of the members of the Bar David family (The Bar David family is a prominent Messianic family living near Jerusalem) speak about what would happen to someone after they die, after hearing the message of salvation and then rejecting it. The message made a deep impression on Gideon. I knew for sure that Gideon was telling me the truth, because he was not the type of person who would exaggerate. But I couldn’t keep it too myself. So I called Yacov Damcani immediately and told him that Gideon had accepted Yeshua into his heart. Then in my excitement I called several other friends. Within a few hours everyone knew! When Noam arrived home, we picked him up at the airport. 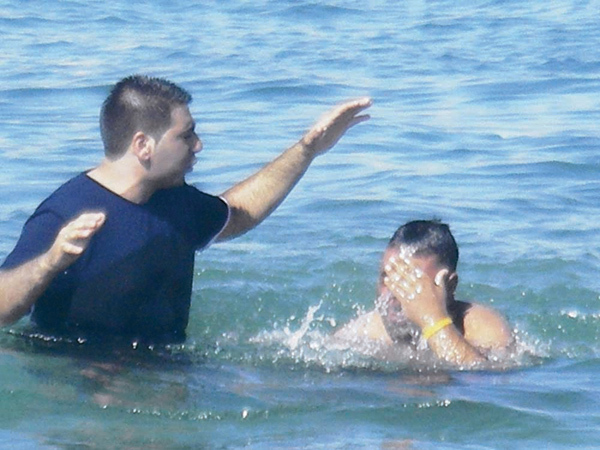 He greeted Gideon with, “Shalom, my brother!” Someone had already called him with the good news while he was in the U.S. Noam prayed again with him, and together they sealed Gideon’s commitment of his life to the Lord. Because of changing circumstances, we had been without a congregation for several months. Meanwhile, our daughter and her husband had joined Congregation Tiferet Yeshua, and they encouraged us to come too. After attending a few times we decided that this was the place where God ultimately wanted us to serve. When I really began to feel as if this was my congregational home when I became the coordinator for all the volunteers who serve each week in the congregation. I need to be able to give of myself. Gideon also volunteers for a variety of jobs in the congregation. For the first time in my life, I can honestly say that I wanted to stop smoking. But up until then, I had been smoking two packs a day for 38 years, and I realized that in order to give up that kind of habit, I would have to get supernatural help. So I began to pray that God would give me the desire to quit. For one year I prayed that prayer, and I went forward to receive prayer from Ari and the elders for that one thing that God would give me the desire to stop smoking. 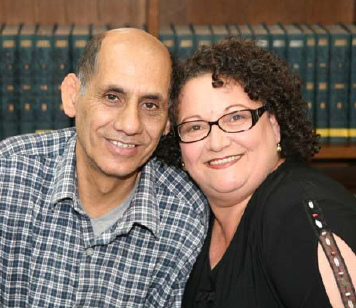 Then one Shabbat morning, Lisa Moses (Lisa Moses and her husband Yossi have been a solid part of Tiferet Yeshua core group almost from the beginning of the congregation), one of the earliest believers in our congregation, gave a testimony of how she had been smoking three packs a day for 16 years, but nine years ago the Lord had delivered her completely. Today, she said, was her nine year anniversary free from cigarettes! I was jealous, and that really motivated me to pray that God would deliver me. On November 11, 2005, I quit altogether. The moment I put the cigarettes down, God gave me the strength, and I have never had another cigarette to this day! That same day Gideon looked at me, smoked one last cigarette and then he too completely stopped! I have been overweight, and I was determined that when I stopped smoking I was not going to gain more weight. 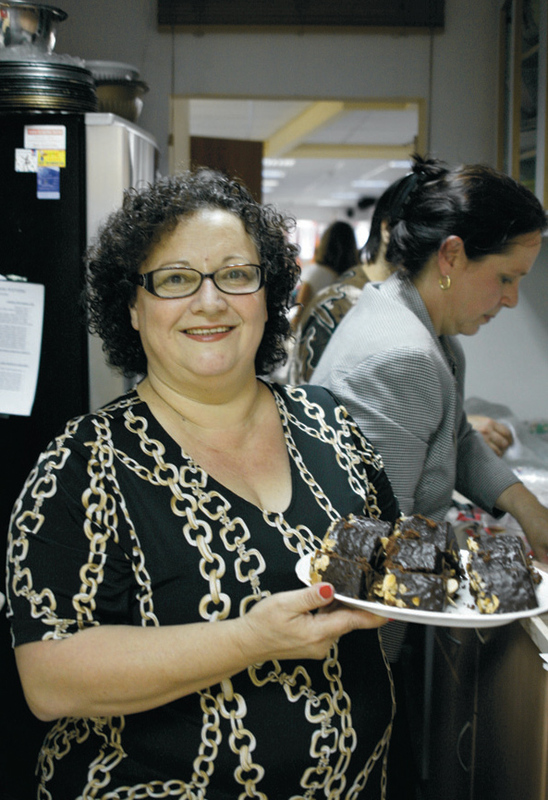 It was through the help of one of our counselors at Tiferet Yeshua, Fruma Knight (Fruma Knight is a professional counselor in Tiferet Yeshua and also a Maoz UK board member. Her husband Bob is an active volunteer in the congregation) I decided that I was going to make a change in my lifestyle. Since October 2006, I have lost 36 pounds and am continuing to lose weight. Our two daughters and our 12-year-old granddaughter had received Yeshua as their Lord and Savior, but our son, Avi had not yet come to a personal relationship with the Messiah. Some time back, Avi was sent to prison for a short time and, from there, he called us to tell us that he had accepted Yeshua. What joy we had! However, believe it or not, an hour later he called us again and said that he began talking to an Orthodox inmate about his newfound faith in Yeshua, and the Orthodox man immediately showed him that Yeshua could not be the Messiah. Avi has never since acknowledged Yeshua as his Lord. suicide bomber exploded a 45 pound nail bomb, killing 14 people and injuring 75. Part of a body fell on Avi. As a result, Avi went into shock, a condition certified by the government, from which he has never recovered, and today, he is 100% emotionally disabled as a result of that attack. Then on January 20, 2003, he was in the old Tel Aviv central bus station and another suicide bomber exploded himself, killing 23 and wounding 120. Three months later, Avi was sitting outside a bar when yet a third suicide bomber exploded himself, killing three and wounding 50.
little bit of money given to him by the government for his disability, he chooses to spend on marijuana and hashish in an attempt to escape his crushing fears. We continue to pray daily for Avi’s salvation. Only God can save and heal our son. We would be so grateful for anyone who would feel led to join us in praying for Avi. The God of Israel has done great things for our family, and because of the miracles we have experienced in the past, we are believing that God will surely answer the prayers for our son. However, there are branches among Orthodox Jews that are giving priority to the study of the Bible. One such individual was Rabbi Mordechai Breuer who recently died at the age of 86. He was born into a family of modern Orthodoxy and became a highly respected authority - although virtually unknown outside of Israel - on the Old Testament books of the Bible. 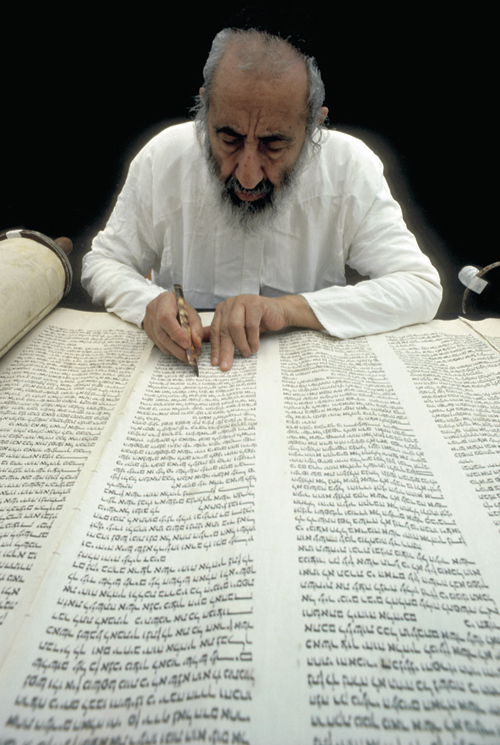 A scribe checking and verifying the accuracy of a hand-written copy of the Torah. Up until the 1950's, the complete manuscript in Aleppo was still in good condition. But with the creation of the modern state of Israel, and the ensuing Arab rioting, scholars pleaded with the Aleppo rabbis to move the Bible to a safer location. 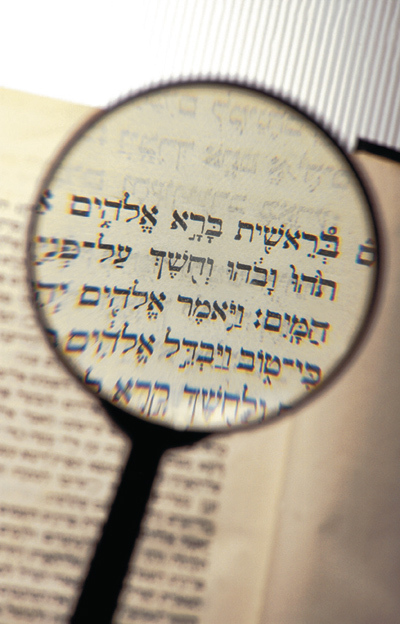 In 1968, Rabbi Mordechai Breuer was assigned the task of determining the Hebrew Bible's wording, spelling, vowels and cantillation (chanting) from ancient manuscripts for a modern Bible commentary which would be faithful to the belief that the Biblical text was inspired by God. archeological discovery in the 20th century. 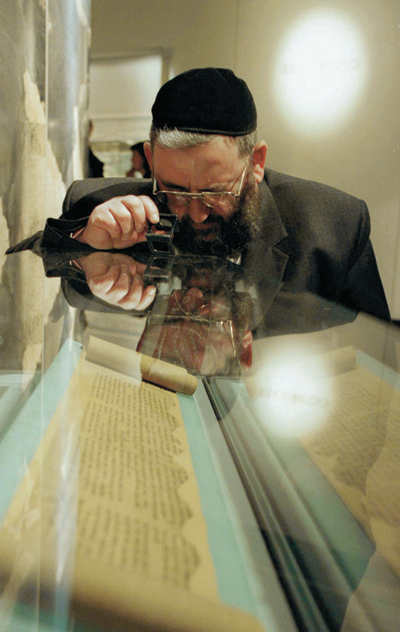 Thus, Rabbi Breuer reconstructed the entire Old Testament by examining each word in the five most important ancient manuscripts. And then his wildest dream came true. Somehow, he managed to get his hands on a copy of the Aleppo Codex. He never even told his son how he came to possess the facsimiles, but the son said when he came home that day with the manuscript, "he acted like an accomplice to a crime!" Rabbi Breuer later issued an independent version of the entire Old Testament that was quickly accepted as the most reliable and accurate. The "Jerusalem Crown" Bible is a modern version of the Hebrew Scriptures based on the Aleppo Codex and the reconstruction work of Breuer. It is the official version of the Bible of the State of Israel and used when the President of Israel is sworn into office. There is one very interesting difference found in the Dead Sea Scrolls in Psalm 22:17 (English, 22:16). The Masoretic texts read "like a lion are my hands and feet" which does not make sense. But the Septuagint - a Greek translation of the Old Testament by Jewish scholars in the second century B.C., - reads, "They have pierced my hands and feet." 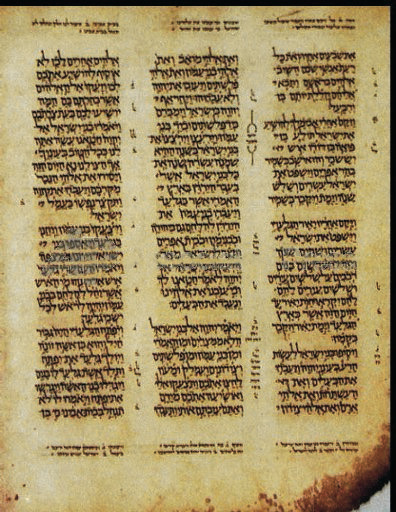 Because for many hundreds of years the original scrolls were written without chapter and verse divisions, without vowels and without spaces between words, the meaning and pronunciation (inserting the vowel sounds) of the Hebrew text was transmitted only orally from father to son, teacher to student, and was called the Mesorah (meaning tradition or "that handed down"). Of course the words themselves in the Old Testament were always written down and passed on to each generation on scrolls. But often the pronunciation and the meaning was not clear. So the scribes and holy men of God living during the times of the writing of the Bible passed on their knowledge of how a word should be pronounced, what the meaning of an unclear word meant and other instructions that made the Hebrew text understandable. After generations passed, but before the birth of the Messiah, the earliest Masorete scribes began to standardize the books of the Bible, dividing the text into books, sections, paragraphs, verses and clauses. They then fixed the pronunciation and cantillation according to the Mesorah. But since absolutely no additions were allowed to be made to the official holy text itself, the early Masoretes adopted other devices; they marked the various divisions by spacing and made other dots and signs to guide the reader without in any way violating the text. Thus God's Word was protected throughout the centureis from even well-meaning human intervention. In the 10th century A.D., a Mesorah expert named Aaron Ben-Asher from Tiberius, copied the Bible and compiled and recorded in a very systematic way all the notations and marks which had come down in oral tradition and which had been recorded on ancient manuscripts more than a thousand years before. 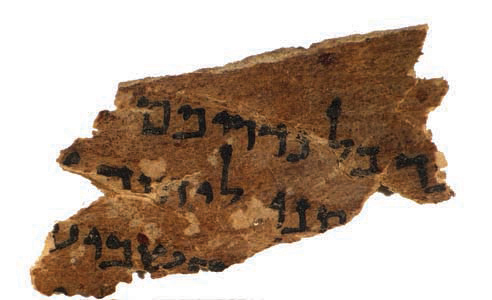 The discovery of the Dead Sea Scrolls only confirms that Aaron Ben-Asher has given to posterity a faithful and accurate copy of the Word of God, by recording in a very expert fashion that which had been preserved by ancient Jewish scholars through the ages. Most translations of the Old Testament are based on manuscripts whose scholars had access to the Ben-Asher Bible before it arrived in Aleppo and was closed to scholarly scrutiny for centuries. Who but the only true God, all powerful, could have preserved His Word through generations of hand-written manuscripts? * Modern studies with computers have shown the Aleppo Codex to be the most accurate representation of the masoretic principles to be found in any extant manuscript, containing very few errors among the millions of orthographic details that make up the masoretic text. The very first Bible translated in English was done by William Tyndale in 1526. He was labeled the "son of Antichrist" by Sir Thomas More, Lord High Chancellor, and finally burned at the stake for his heresy. His dying words were, "Lord, open the King of England's eyes!" After only five years, God answered Tyndale's prayer and Henry VIII approved the printing of Tyndale's translation. Seventy years later, King James I gathered the most knowledgeable and best Bible scholars in England and sponsored the translation of the Bible known as the King James Version. 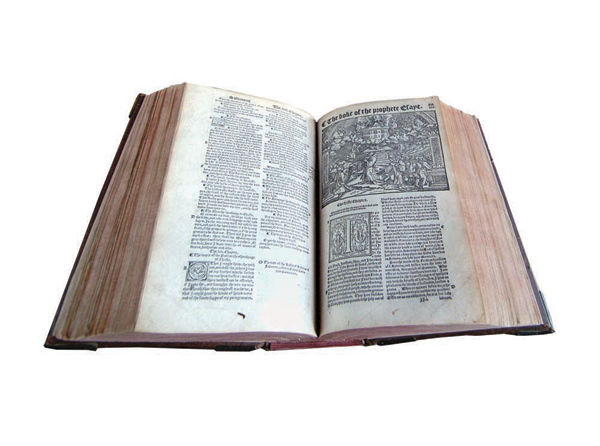 By 1611, this Bible was published and became the authorized version of the common people. The king made it mandatory that every congregation in the Church of England keep a copy of the Bible so that ordinary people could come in and read at their leisure - much to the dismay and anger of the clergy. It never ceases to amaze how God could use to His glory a man like King James, who was one of the most ungodly and wicked of England's royalty. BECOME A WALL OF HONOR PARTNER TODAY! Join this elite team of partners who desire to bless israel! Please let us know if you have named Maoz Israel Ministries in your will, trust or estate. 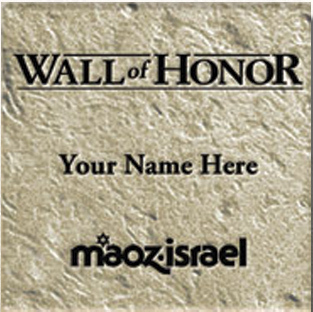 We want to honor you as a member of the Maoz Israel Wall of Honor. When you join the Wall of Honor, you will receive a beautiful stone plaque with your name on it, and your name will be placed on the Wall of Honor in Israel, as well! For more information on how to include Maoz in your will or about how a charitable gift annuity might benefit you today and help serve Maoz's future impact on Israel, please contact Jim at 800-856-7060. There is something so utterly special about the Jewish people. Not special in themselves, if you can understand what we mean. But so special the way God has chosen to use His... chosen people! As Israel fell away from the only true God, still God preserved His Holy Word through them! Even though they have been in exile, He still guarded the land that God promised Abraham and His children. And He is still bringing His people back home. Every week, Jews arrive from all over the world to settle in Israel. And the culmination of God's phenomenal plan is to save Israel from their sins. To redeem His people and make them - what He promised - a light to bring salvation to the nations. For that He is raising up today in Israel a core group of people with many gifts and callings that He is using to bring His chosen ones back to Him. If you noticed in the testimony of Orlet and Gideon, many people were involved in their salvation. First their relative, Avihai, then the evangelist Yacov Damcani, followed by many others. And this is the rule rather than the exception. Nearly always, a number of believers, each doing their part and exercising their gifts, lead a person towards the Messiah - until he or she receives the gift of salvation. Afterwards, many other people are involved in discipleship and training and caring for their special and unique needs in order for them to become fruitful and beneficial in the Lord's harvest field. That is why we have a congregation. That is why we are convinced that only in the atmosphere of a functioning and flourishing community of believers will we see the results that we know God wants to give us. To oversee a growing congregation in Israel, one needs all the anointing possible - as every pastor will tell you! There is a great deal of prayer and intercession needed. There is the raising up of teachers and preachers and worship leaders and musicians and volunteers for an extraordinary variety of needs. There is the overseeing of teachers for children, youth leaders and people who are willing to put out the enormous energy it takes to have a vibrant home group. And all this must be harmonized by people gifted with organizational skills. 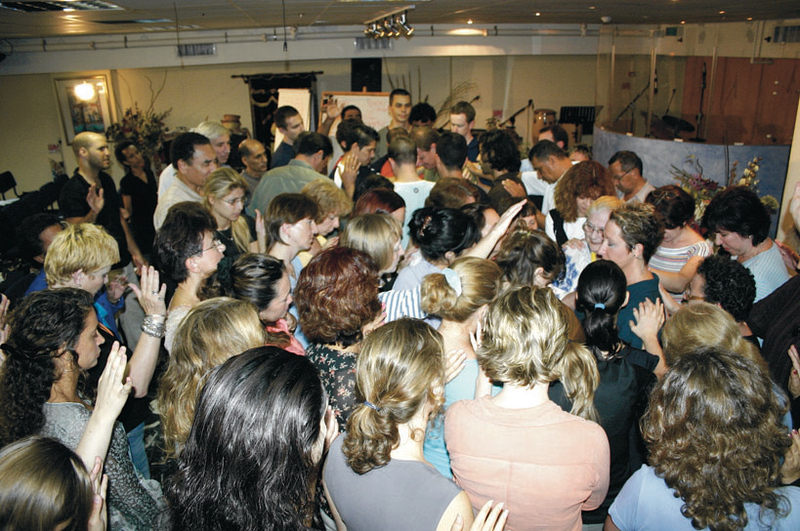 And of course there is the financial undertaking that is always met only through great supernatural miracles because of the calling we have had - which is to establish and oversee a thriving Israeli congregation in downtown Tel Aviv. When you give, know that your part is as essential as any other person's in the development of this congregation. You are part and parcel of God's everlasting promise and plan to bring His chosen people back to Him. Because of God's Word that promises us that one day all Israel shall be saved, we know we will continue to see a constant increase in the number of people coming to salvation and growing in maturity as believers. Our partnership is fulfilling the will of God in bringing the Gospel to His people who have suffered so much, but to whom the Promise is sure! We bless you, our co-worker, from Israel with love and appreciation!